Fri., Jan. 15, 2010, 10:26 a.m. There was quite a bit of interest in the first speaker to address a rather obscure subcommittee of the House Resources Committee today: State Parks Director Nancy Merrill. She's at the center of one of Gov. Butch Otter's most controversial budget cuts for next year - his "conceptual" proposal to eliminate the state Department of Parks & Recreation, sell its headquarters buildings and merge park operations into the state Department of Lands. Otter has indicated he may keep the department if a case can be made for how it can continue to operate, but lose most of its $6.4 million in state funding. Merrill, however, merely said how honored she was to be the first speaker to address the panel, and introduced her staff members who were handling the three administrative rule changes on the subcommittee's agenda. 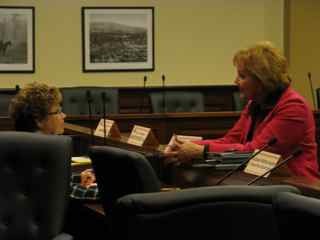 Afterward, she huddled with subcommittee Chair Rep. JoAn Wood, R-Rigby, then left the room without commenting to waiting reporters, shepherded by DFM analyst Keith Reynolds, who said she was due at a meeting with the governor's staff.